Obviously, we are now at the height of the salad season. I have an abundance of rocket, leaf salads, radishes, cress, mustard greens and more. And yet, I am about to do a post that focuses largely on the less usual salads and ingredients that I have been having since last I updated you on the 52 week Salad challenge. 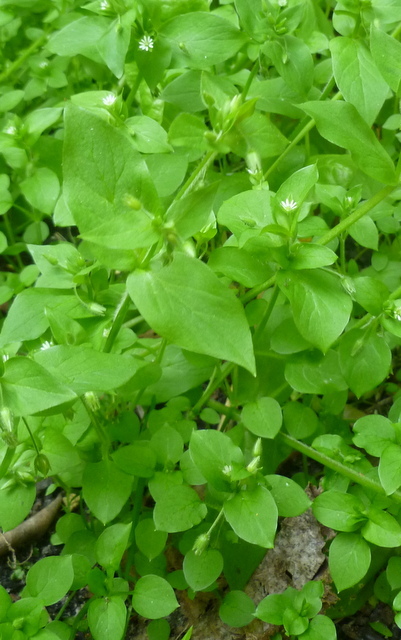 I remain loyal to chickweed, and luckily it seems to remain loyal to me. I have been eating it for what seems like months now. I remember that I lamented the lack of chickweed back in the spring, and thought that the conditions in the Netherlands were not suitable. It turns out that I was wrong. Chickweed loves the growing conditions here, but it does appear about 6 weeks after it would in the UK. It has kept me and the guinea pigs happy for quite a while. I have no idea why people write this off as a weed, I think it is delicious. 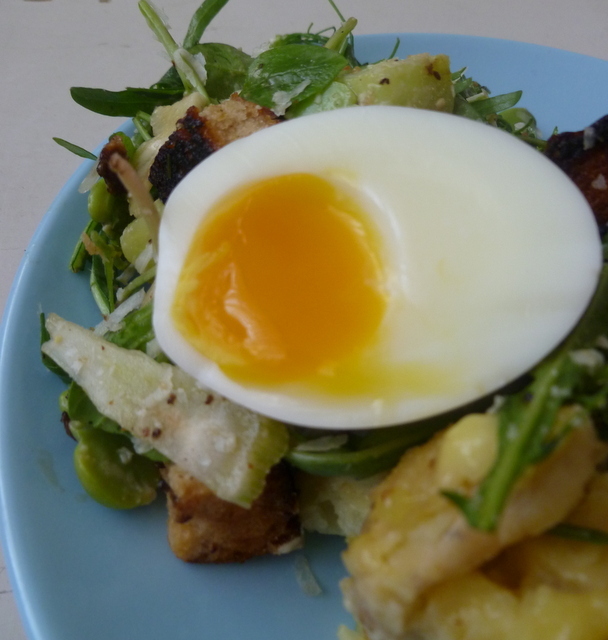 Back in June, I was also including broad bean tips to my salads. These really are the gardener’s treat, as they don’t keep well, so must be used fresh from the plant. This year, I was also fortuitous in that I hadn’t quite got round to eating my dock and digging it up. I have discovered that blackfly love dock much more than my beans, so they remained pretty free from these sap suckers. Since dock is edible, and has proven to be so effective, I shall probably not be so hasty to remove it all in future, as long as it stays out of my raised beds. This past month, herbs have also featured heavily. 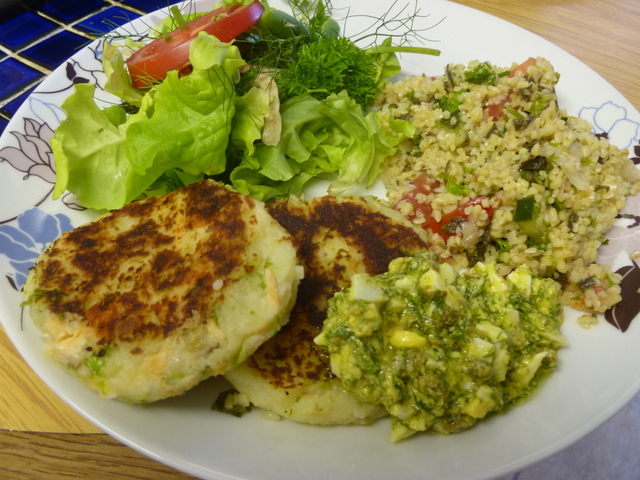 I am finding that herb fennel, dill, mint, basil, and parsley have become a regular addition to my salads, as well as providing me with lots of tabbouleh, and sauces. I have also been adding herbs to salad dressings. I’ve always used thyme, of course but lately, my oregano has gone crazy, so I have been looking for recipes to use it in. I found this lovely oregano, mint and lime dressing by Laura of How to Cook Good Food. 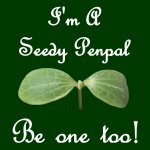 It was an entry in Karen’s Herbs on Saturday Challenge, and has been on heavy rotation in our house since I came across it. It is really a salad dressing for summer. 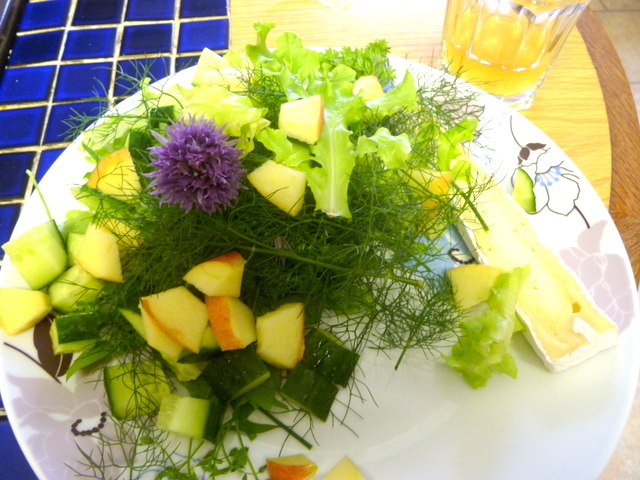 Back when it was my Mum’s birthday, I made a lovely collaborative salad of leaf lettuce from my sister’s garden, fennel, mint and chives from my mum’s garden, and foraged chickweed. I also added carrot and radish leaves, and was very happy when it all went at her birthday barbecue. 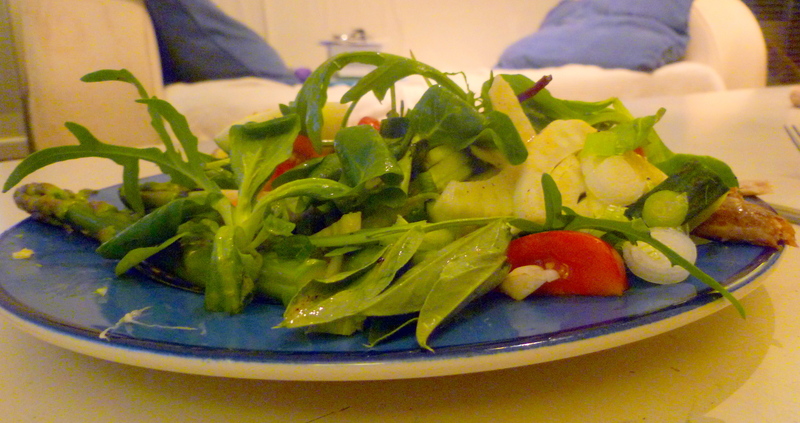 I also livened up a simple pasta and chive salad, by mixing in a separated chive flower. I think I converted one of Mum’s friends, who was pretty amazed when she found what it was. She didn’t know chive flowers were edible, but said she would try them from now on. Another herb that has been featuring in my cooking of late is chervil. Although you rarely see chervil in the shops it is really easy to grow, and I have many pots and planters with it. I love this delicate little herb, and it makes a great addition to any salad. 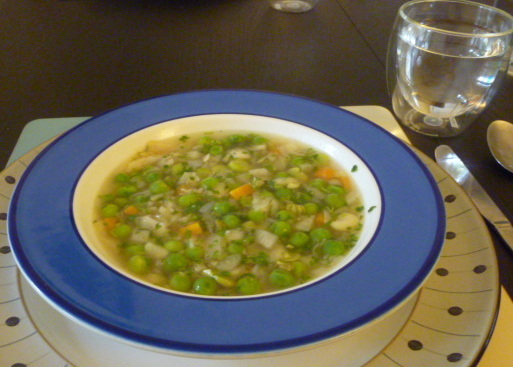 It goes so well with broad beans and peas too, as you can see from this vegetable nage I made a while ago. Something else I really love, especially when the weather is a little too cold for salad is to braise lettuce, beans and peas in a good stock. A dish that is made even better by the addition of a little chervil just before serving. 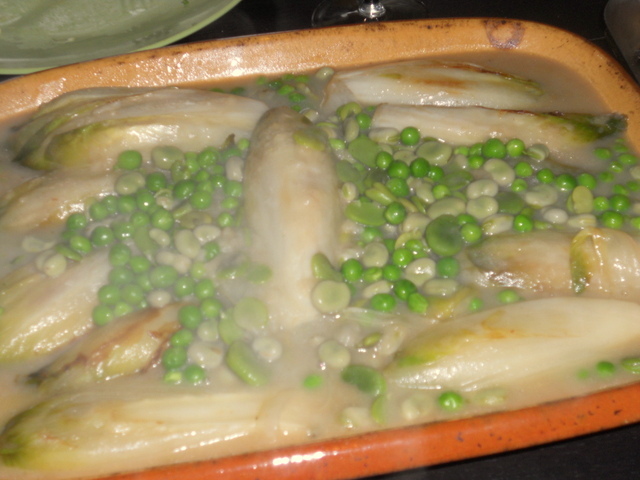 Briefly cook the beans and peas in unsalted boiling water. You can use the same pan, but the beans will need 3-5 minutes, depending on size, and the peas will need 1-2, so add the peas to the pan after the beans have had a couple of minutes. Once they are cooked, drain and refresh in cold or iced water. Halve and rinse the little gems. You need to keep the stalk, so that the lettuce stays together during the cooking. In a sauté pan, heat a little oil. Once hot, add the lettuce and cook briefly. You want a little colour on the leaves, but be careful, as they will burn easily. Turn them once to get similar colour on each side. If you prefer a thicker sauce, you could stir in about a tbsp. of flour at this point, and cook it out briefly. I don’t often bother with this stage, unless I am going to use this as a soup. Add the stock, and cover. Bring to the boil then simmer for about five minutes. Add the peas and beans and heat through for another minute or so. Just before you serve, season a little, if needed and stir through the chervil. This makes a great accompaniment for most main courses, or you can shred the lettuce a little when it is cooked, stir through a little cream, and serve as a light soup. You’re welcome, and thank you for a great dressing. Wow, there’s loads of ideas here! I haven’y quite steeled myself to try dock yet, but I’m loving that the challenge is getting me lots of new salad leaves and edible flowers. Sorry I didn’t get this post out last week, I was rushing, and didn’t set the schedule properly.